Mid-East League rivals St. Marys and Silver Lake will meet in the first round of the 3A playoffs for the second consecutive season. Last season the Eagle rolled to a 46-6 win en route to a state championship game appearance and a state runner-up finish. Back in Week 5 of this season, the Eagles jumped out to a 20-8 lead after the first quarter, but found themselves trailing the Bears 22-20 after three quarters. Silver Lake scored 13 points in the fourth quarter to claim a 33-22 win over St. Marys. Silver Lake senior quarterback Dailin Kruger missed that game with a knee injury. In his place, junior Ryan Matzke stepped in and rushed for 203 yards and three scores. Kruger has since returned to lead the Eagles, but has been limited primarily to the pocket. He has remained effective in throwing for more than 730 yards and seven touchdowns in his last four games. He has thrown for more than 1,300 yards and 17 touchdowns this season. Cody Renfro and Matzke are Silver Lake’s leading rushers with 470 and 425 yards, respectively. Philip Johnson leads the Bears’ rushing offense with more than 1,300 yards and scored all three St. Marys’ touchdowns in the first meeting. Two teams that advanced to the Class 3A quarterfinals in 2012 will meet in the first round of the playoffs this season. The Colgan Panthers own a balanced offense with 1,513 rushing yards and 1,073 passing yards. Colgan senior quarterback Luke Marquardt has thrown for 890 yards and nine touchdowns. Drew Dawson leads the rushing attack with 843 yards and 16 touchdowns. Tucker Hoffman is the top receiver with 24 catches for 314 yards and three touchdowns. Colgan’s only two losses this season were to a pair of 8-1 teams in 4A’s Columbus and 3A’s Galena. The Panthers, however, may have their toughest test of the season ahead of them. Fifth-ranked Caney Valley boasts the best scoring defense in Class 3A as the Bullpups have allowed only 59 points all season. Caney Valley has posted four shutouts this season. Quarterback Levi Wyrick does a good job directing the Bullpups offense. He ran for 111 yards and two touchdowns, while passing for 70 yards during Caney Valley’s 42-0 win against Neodesha. Caney Valley’s only loss was 21-6 to undefeated and second-ranked Conway Springs during the second week of the season. Phillipsburg, with 14 seniors, has won several grind-it-out contests, including a 14-6 Week 3 victory against Oakley, a 33-6 victory against Hoisington in Week 4, and a 20-16 win versus rival Norton last week to clinch a playoff berth. As well, Phillipsburg limited Beloit’s explosive offense to 6.6 yards per play; Beloit’s worst this season for a game is 6.4 yards per play. Senior Andrew Makings, the team leader with seven sacks, will miss his fourth straight contest with a foot injury. For Phillipsburg, senior quarterback Riley Juenemann has capably replaced Sean Newlan, now at Kansas State University, and ranks in the top-10 in passing efficiency among Kansas 11-man quarterbacks. He finished 8 of 11 for 109 yards and a score last Thursday and is 48 of 81 for 1,097 yards and a 9/3 TD/INT ratio. This is Sacred Heart’s 24th playoff appearance. Currently under former Norton coach Bruce Graber, the Knights have made the postseason every year since 1998 except 2009. Sacred Heart is tied for fifth in 3A with 395 points and features senior quarterback Nick Wuthnow, who has accounted for more than 1,500 total yards. Both of those squads have only lost to Beloit. This is the first meeting between the two teams since Sacred Heart won, 53-26, on Halloween 2006. This contest will be much closer, but the Panthers’ defense is too strong for Sacred Heart’s offense. Holcomb is battle-tested against 3A’s No. 10-hardest strength of schedule. The Longhorns, led by senior all-everything quarterback Heath Tucker, has outscored opponents 263-164. 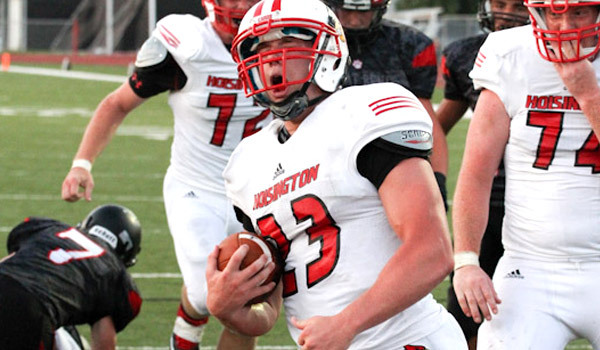 Hoisington has also played a tough schedule and ranks No. 16 in Class 3A with a 192-162 margin. Tucker, one of Kansas’ fastest players, has had some trouble with turnovers with nine interceptions against seven touchdowns. He has completed 53 of 92 passes for 907 yards, and leads the team with 129 carries for 850 yards and 11 scores. As well, Tucker has 499 return yards. Hoisington junior Nolan McCurry has 164 carries for 1,191 yards and 15 scores, including 32 carries for 310 yards and four scores in a must-win 26-17 win against Thomas More Prep-Marian. Hoisington has lost in the first round its last two trips, including a 28-7 victory versus the Cardinals last season. Holcomb had lost seven straight first round games before it broke through with a victory last season for the first time since 2003. The Longhorns get another one here.